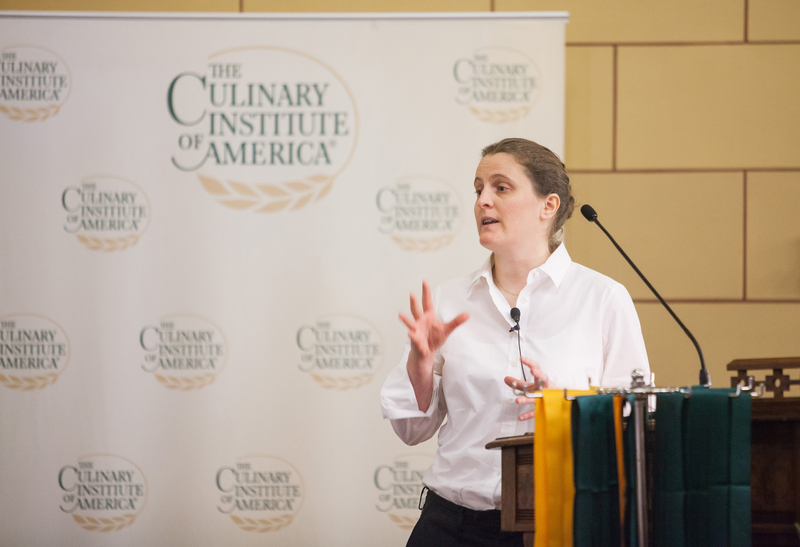 Hyde Park, NY – April Bloomfield, executive chef and co-owner of The Spotted Pig and several other popular New York restaurants, told graduates of The Culinary Institute of America (CIA) that hard work can lead to great opportunities during their careers. Chef Bloomfield was keynote speaker at commencement for 54 associate degree candidates at the CIA's Hyde Park, NY campus on Friday, January 17. The previous day, Michael Hickey, executive vice president of Ecolab, delivered the address at the college's baccalaureate commencement. "A life in food is not an easy life. It takes stamina," said Bloomfield, a native of England who was named one of America's Best New Chefs by Food & Wine magazine in 2007. "But if you pay attention, keep your head down, and push hard every day, it will be the most rewarding career. You'll eat amazing food. You might get to meet your heroes and even work with them." Bloomfield is one of 10 female chefs in the United States to hold a Michelin Guide star. 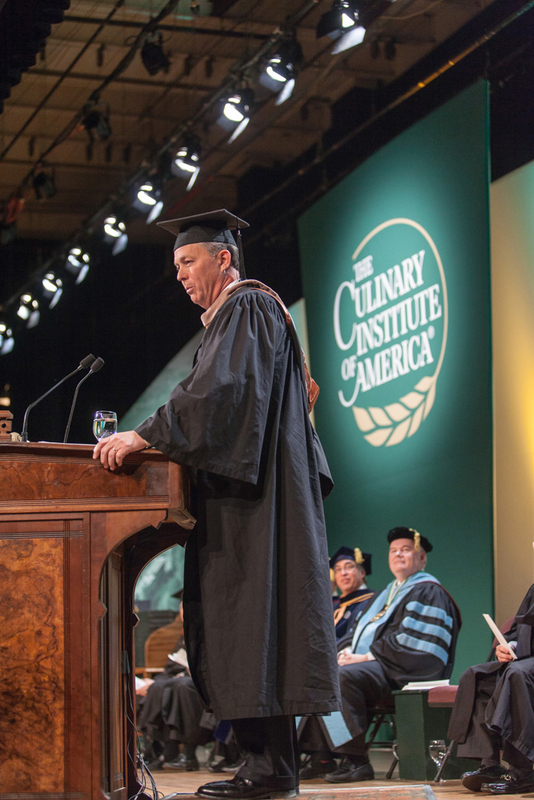 In a ceremony at the Mid-Hudson Civic Center in Poughkeepsie on January 16, Mr. Hickey spoke to 153 CIA graduates earning management degrees in culinary arts and baking and pastry arts. Hickey has been with St. Paul, MN-based Ecolab for 28 years. The company provides water, hygiene, and energy technologies for restaurants, industrial settings, and institutions such as colleges and hospitals. "Globalization and the pace of change are happening faster than ever before," Hickey advised graduates. "No matter what happens in the industry, the fundamentals you learned at the CIA will be with you forever. The fundamentals of hard work will never change, and those who are most successful never forget that customers are the reason we're here." With construction of the college's Marriott Pavilion nearing completion, the next baccalaureate commencement, on May 1, will be held on campus in the building's 800-seat theater.